Flip burgers with a will. With salad made from potatoes. For the whole day to be fun. The whole day will turn out right! If you need a story to read the kids, try Fairy Independence Day. Oh, your rained off plans sound very British Brenda!!! 😀 We have that all the time, so much effort goes into the planning of a day and then – RAIN! 😐 It’s good to be flexible though. I hope you had a lovely time and got to enjoy all that delicious food and sparkly fireworks. Sounds like my kind of fun! Though like you said, luckily there’s flexibility! We did have a happy holiday, thanks! Very interesting and creative picture! Be-lated happy to you as well! I did! Nice and relaxing. Did you? You lost me, what tree? 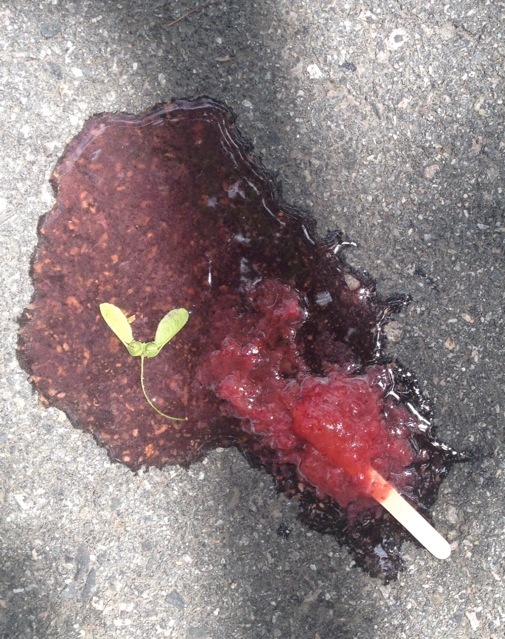 I put a picture up of a melting popsicle, so I’m not sure where the tree is. I had that problem with another post, where it had a photo of a mushroom showing that was not in my version. This post has a tree??? Oh!! I had that in at one point, and I deleted it. I decided on the popsicle picture. How weird. Do you see the popsicle, too, or just the tree? Hmmm… Don’t know how to fix it. So many frustrating things about WP. That sounds so happy and fun! You’ve captured the essense of celebration in your words Brenda. Happy Independence Day! Thanks, I thought I would write about all the things I hope we get to do, then hurricane rain! Last year no hurricanes at all, and this year they are starting in July, two months early! Great post for our birthday!! Enjoy!! Celebrate ALL month – no one says it HAS to be today – Enjoy!! Exactly!! LOL Always happy to be in this great country!